Special Rafting Trips for Special People - YOU! Carolina Outfitters Outpost Building. Rafters arriving from Andrews on 19 North/74 East check-in here for outfitting and transportation to the river. Rafters arriving from Bryson City on 19 South/74 West arrive here for outfitting and transportation to the river. 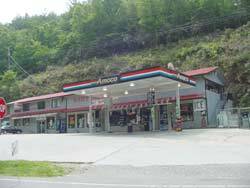 IF TRAVELING FROM BRYSON CITY, N.C.
Take Highway 74 West about 11 miles to the Nantahala Food Mart/Gas Station, located on the left side of the road at Wesser. (The 4-lane highway, 74 West, will change from a 4-lane into a 2-lane highway. It will have been 2-lane for about 3 miles when you reach the Gas Station on the left. ) Continue on about 10.2 miles further on Hwy 74 West to the Carolina Outfitters Rafting outpost building to get pre-trip instructions and outfitting and transportation for your rafting trip. IF TRAVELING FROM ANDREWS, N.C.
Nantahala Food Mart/Gas Station as viewed arriving from Andrews on 19 North/74 East. This is the check-in and key pick-up point for lodging guests arriving for cabin rentals. Take Highway 74 East about 20 miles to Nantahala Food Mart/Gas Station for check-in, key pick-up, and specific directions to your lodging. The Gas Station will be on the right side of the road at the intersection of Highway 74 and Wesser Creek Road. Take 1-40 West. Take exit 27 off of 1-40 West. Exit 27 puts you on Highway 74 West. Follow 74 West, bypass Waynesville, Sylva, and Bryson City, N.C. Continue on past Bryson City approximately 11 miles on 74 West. There is a gray 2-story Gas Station (Nantahala Food Mart & Gift Shop) on the left side of the road. This will be about 3 miles after highway 74 changes from a 4-lane into a 2-lane highway. Come into the Nantahala Food Mart Gas Station/Gift Shop to check in and pay (if you haven't pre-paid) for rafting, or to check in and get your keys for lodging. If you have prepaid for rafting you may continue on to the Carolina Outfitters Outpost Building 10.2 miles further. Take I-85 South to I-26 West. Take I-26 West to I-40 West near Asheville, N.C. Take I-40 West. Take Exit 27 off of I-40 West. Exit 27 puts you onto Highway 74 West. Follow Highway 74 West. Bypass Waynesville, Sylva, and Bryson City, N.C. Continue on past Bryson City approximately 11 miles on 74 West. There is a gray 2-story Gas Station (Nantahala Food Mart & Gift Shop) on the left side of the road. This will be about 3 miles after highway 74 changes from a 4-lane into a 2-lane highway. Come into the Nantahala Food Mart Gas Station/Gift Shop to check in and pay (if you haven't pre-paid) for rafting, or to check in and get your keys for lodging. 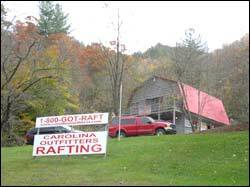 If you have prepaid for rafting you may continue on to the Carolina Outfitters Outpost Building 10.2 miles further. Take Highway 28 about 25 miles to where it runs into Highway 74. Take a right onto Highway 74 West. Go about 3 miles to the Nantahala Food Mart/Gas Station on the left side of the road. Come into the Nantahala Food Mart Gas Station/Gift Shop to check in and pay (if you haven't pre-paid) for rafting, or to check in and get your keys for lodging. 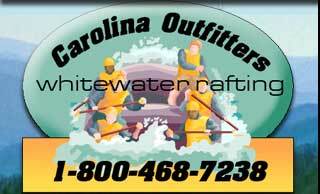 If you have prepaid for rafting you may continue on to the Carolina Outfitters Outpost Building 10.2 miles further. Take Highway 441 South several miles past Cherokee, N.C. to Highway 74 West. Take 74 West several miles, bypass Bryson City and travel about 11 more miles until you come to a gray two-story Gas Station Station (Nantahala Food Mart & Gift Shop) on the left side of the road. Come into the Gas Station gift shop to check in & pay for rafting or to check in & get keys for lodging. Nantahala Food Mart/Gas Station as you approach from Bryson City on Hwy 19 South/74 West. This is the lodging check-in and key pick-up point for vacation rentals. Rafters stop here for your raft check-in (30 minutes prior to trip time) if you are arriving from this direction, and then drive on to the Carolina Outfitters Outpost Building for outfitting and transportation to the river. Take I-75 North to Cleveland. At Cleveland take 64 East through Ocoee and Copper Hill to Murphy, N.C. At Murphy Highway 64/74 becomes Highway 19/74. Continue to follow 74 East, bypass Murphy and Andrews. Just after Andrews Highway 74 East becomes a 2-lane road. Go about 10 miles past Andrews and Carolina Outfitters Rafting is on the right side of the road. (TIP: When you see where 129 turns left going to Robbinsville, N.C., just STAY STRAIGHT AHEAD ON 74 EAST and our raft building is just about ½ mile more on 74 East. If you want to get keys for a vacation home lodging unit, you will drive on to the Gas Station, about 10 miles further on the right. Take I-75 North to I-575 North. I-575 North will become Highway 5 North, and then Hwy 76 as you go by Woodstock, Jasper, Ellijay, and Blue Ridge. At Blue Ridge go through several traffic lights & past the Ford and Chrysler Dealerships to the traffic light at Highway 60. Turn left onto Highway 60 and go to a small community of Mineral Bluff. Take a right onto Highway Spur 60 at a Red Brick Church in Mineral Bluff, and follow it until it dead-ends at Highway 64/74. Take a right and go East on 74. Bypass Murphy and Andrews. Just after Andrews Highway 74 East becomes a 2-lane road. Go about 10 miles past Andrews and Carolina Outfitters Rafting is on the right side of the road. (TIP: When you see where 129 turns left going to Robbinsville, N.C., just STAY STRAIGHT AHEAD ON 74 EAST and our raft building is just about ½ mile more on 74 East.) If you want to get keys for a vacation home lodging unit, you will drive to the Gas Station, about 10 more miles on the right side of the road. Follow Highway 441 North. Bypass Franklin, and go to Dillsboro to where 441 North intersects with 74 West. Follow 74 West, bypass Bryson City. Go about 8 miles past Bryson City and 74 West turns from a 4-lane highway into a 2-lane highway. 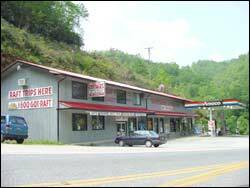 Go about 3 more miles to Nantahala Food Mart/Gas Station, a gray 2 story building on the left side of the road. Come into the Gas Station to check-in and pay, about 30 minutes prior to your trip arrival time at Carolina Outfitters, and then drive on up to the raft building. Follow I-26 West to I-40 West near Asheville, N.C. Take 40 West to Exit 27. Take Exit 27. It puts you on Highway 74 West. Follow 74 West, bypass Waynesville, Sylva, and Bryson City, N.C. Continue on past Bryson City about 11 miles on 74 West. There is a gray 2-story Gas Station Station (Nantahala Food Mart & Gift Shop) on the left side of the road. This will be about 3 miles after the 4-lane has changed back into a 2-lane highway. Come into the Gas Station gift shop to check in and pay, and then drive on to the raft building. Arrive at the Gas Station about 30 minutes prior to your trip arrival time at the raft building.